I remember the first time I heard Ontario-based Chris Greenwood, better known as Manafest, on Air1 Radio. It was 2010 when “Avalanche” was debuting, and, like many fans, I was in awe of Manafest’s hip-hop/heavy rock mixture. I was very eager to listen to his full-length album The Chase that released that same year. I was not at all disappointed, as several other outstanding rock anthems, such as “No Plan B,” “Fire in the Kitchen,” “Every Time You Run,” and the title track, became chart-toppers and fan-favorites. On the heels of The Chase, Manafest released Fighter two years later, which featured the title track, “Human,” and the redemptive “Never Let You Go.” And while Manafest doesn’t shy away from his faith in Jesus Christ, encouraging listeners to live out their dreams and refuse to settle for anything less, he has also seen major mainstream success, as his songs have been featured in many major video games, TV shows, and movies. With his ninth studio album Stones, Manafest finds himself independent, which is not unfamiliar territory for the former professional skateboarder: in 2001, he debuted with his independent EP titled Misled Youth. 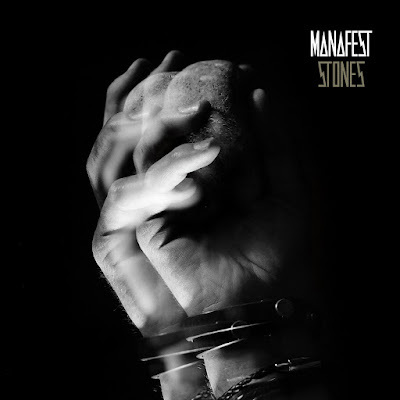 But “independent” is not to be mistaken with “poorly-produced”; I was pleasantly surprised to see that Manafest’s Stones continues his winning-streak of high-energy, hip-hop/rock, following in the exact footsteps of The Chase and Fighter, sure to please long-time fans of his! The title track, a musical twin of “Pushover,” opens the album. In his signature style, Manafest immediately begins his message of steadfastness and relentlessness, refusing to quit when the pressure gets hard. A major highlight of this opening track is the chanting “No!” throughout the strong chorus, as well as the bridge, where Manafest chants, “You cant, You can’t touch this!” There is a strong sensation of invincibility in this opening track; as Manafest shares, this track’s lyrics are a reference to Matthew 7, the man whose house is built on the rock and therefore cannot be shaken. “House of Cards” follows, a hard rock track filled with intense desperation, as Manafest cries out, “I don’t want to live like this/ I refuse to call it quits!” His “fighter” theme rings out yet again, highlighted by outstanding lead guitar solos throughout that easily make this one of the standout tracks off Stones. With a revolution theme, “Firestarter” is my personal favorite track, as Manafest sings, “I want to be a Firestarter/ You can help me if you wanna/ We can spread and make the whole world light up.” This strong rock track, which was co-written with Trevor McNevan (of Thousand Foot Krutch) and Joe Rickard (previously of RED) pounds with a strength to blaze a trail and be original – who God has created us to be. “When the Truth Comes Out” has a haunting desperation feel to it, especially in the pre-chorus rap, where Manafest declares: “All these nights that it kept me up/ And I’ll die if I keep this up!” followed by the strong chorus, where he sings, “When the truth comes out, it’s loud!” I personally found this track hard to follow without reading its lyrics, although it seems to speak of hidden secrets that we’re afraid of anyone seeing, so instead we stay locked up inside. I thoroughly enjoyed the strong pre-chorus followed by its bold chorus, haunting background vocal effects, and awesome guitar solos throughout. Hard rock “Find a Way to Fight,” with its battle cry to “get up and fight,” as well as “Blow You Away,” which is directed at a bad relationship, both reminded me of Kutless’ earlier rock tracks (such as “Treason.” These tracks sandwich another of my personal favorites, “You’re Gonna Rise.” Beginning like a slower Skillet track, with beautiful strings but not too mellow, it is the slowest track off Stones, very much like “Never Let You Go” on Manafest’s Fighter album. Manafest pours courage out on the listener going through a difficult season with his phenomenal lyrics, especially in its strong chorus: “I'll be the light at the end of your tunnel/ and you'll walk away from the grave of your sorrow/ and I'll be your sight when your eyes are blind/ As sure as the sun coming after the darkest night/ You're gonna rise!" In addition to all the strings, drums, and strength combined into a phenomenal track, I also thought that Chris Greenwood’s vocals really stood out in this track. “Coming Back” begins with a funny-sounding pop tempo, but it doesn’t take long to catch the prodigal son lyrics, as Manafest speaks of being at rock-bottom, yet declaring in the strong chorus, “This is my pain, this is my cry/ this is my hope when I need a sign/ ‘Cause I’m never too far, never too far to come back.” A relationship-gone-wrong track with sad lyrics, “Merry Go Round” is nevertheless an awesome hard-rock track with strings (much like Skillet’s “Should’ve When You Could’ve”). Picture one of TobyMac’s high-energy pop tracks off his latest album This is Not a Test, and you can picture “Amplifier.” Featuring nice background vocals and fill-ins from Alicia Simila, Manafest sings about love and its electric effects: “You’re electric/ I can feel the power/ Your love has got me wired/ Heart beats like an amplifier.” It’s hard to tell who he is singing to, as it can be sung either to God or to someone else. Lastly, on an upbeat note, “Won’t Give Up” closes the album, doing what Manafest does best – declaring a message of tenacity and a refusal to quit. It’s a perfect ending to the album, as it well summarizes the standout message of Stones, and all of his previous albums as well. 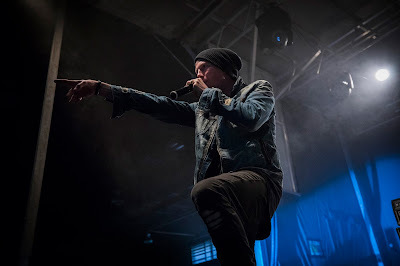 While several of the songs on Stones are hard to follow or vague, overall I think Manafest has followed closely in the footsteps of his The Chase and Fighter albums, which have proved to be his most popular albums to date. This is impressive, as his latest endeavor is an independent one. He has offered a solid eleven-track album with his signature rap/rock style with songs that encourage the listener to never quit, to keep on fighting, and be all that God has created them to be. This is a good review. Thank you, Jay.